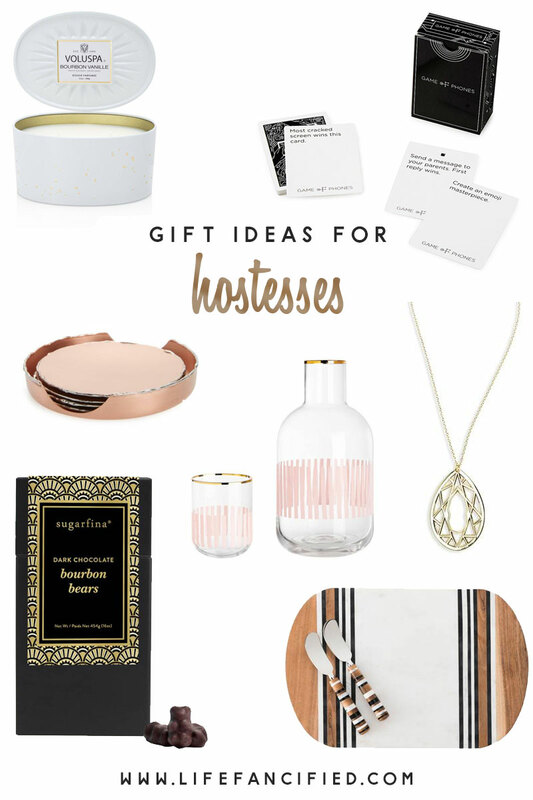 Sometimes you want to branch out from the standard gifts of wine or flowers when you’re visiting someone’s home – in that case, here are 7 fabulously fun, stylish and useful hostess gifts for your favorite hostess with the mostest. Voluspa Candle: Voluspa makes the best candles and this bourbon vanilla scented one is so festive in its pretty silver and gold speckled box, perfect for gifting. Game of Phones: This game looks like so much fun for groups – it’s basically a scavenger hunt using your phone. Missions include “Send a text message to your parents. First reply wins.” and “Take a creative picture of the person to your left.” Definitely works as an icebreaker! Blush Gold Gem Bottle Opener Pendant Necklace: This pretty pendant necklace holds an awesome secret – it doubles as a bottle opener! Especially good if your hostess is a craft beer lover. Juliska Stonewood Stripe Serving Board & Spreaders: Maybe the most fashionable serving board ever – love the mix of marble and wood. Sugarfina Dark Chocolate Bourbon Bears: Is she hosting family for multiple days over the holidays? She needs these. Make no mistake, these cute little gummies pack a boozy punch underneath that 64% Parisian dark chocolate for the best little dose of holiday cheer. Pretty Carafe & Glass Set: This gorgeous blush & gold carafe set is perfect for the guest room or her own bedroom. Rose Gold Coasters: Fancypants gold (rose or yellow) metallic coasters are festive for holidays and year round.